Adds a section header to the menu. Returns the contents stack associated with the menu. A menu presented in a popup window. The menu implements a typical context menu, with support for submenu's. It is a specialized WMenu from which it inherits most of the API. When initially created, the menu is invisible, until popup() or exec() is called. Then, the menu will remain visible until an item is selected, or the user cancels the menu (by hitting Escape or clicking elsewhere). As with WDialog, there are two ways of using the menu. The simplest way is to use one of the synchronous exec() methods, which starts a reentrant event loop and waits until the user cancelled the popup menu (by hitting Escape or clicking elsewhere), or selected an item. Alternatively, you can use one of the popup() methods to show the menu and listen to the triggered signal where you read the result(), or associate the menu with a button using WPushButton::setMenu(). Either you use the WMenuItem itself to identify the action, perhaps by specialization or simply by binding custom data using WMenuItem::setData(). 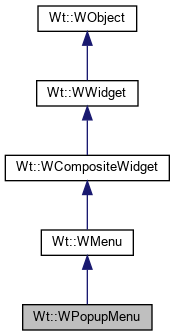 You can bind a separate method to each item's WMenuItem::triggered signal. // ... do associated action. Creates a new popup menu. The menu is hidden, by default, and must be shown using popup() or exec(). Signal emitted when the popup is hidden. Unlike the itemSelected() signal, aboutToHide() is only emitted by the toplevel popup menu (and not by submenus), and is also emitted when no item was selected. You can use result() to get the selected item, which may be 0. Executes the the popup at a position. Displays the popup at a point with document coordinates p, using popup(), and the waits until a menu item is selected, or the menu is cancelled. Returns the selected menu (or sub-menu) item, or 0 if the user cancelled the menu. Executes the the popup at the location of a mouse event. This is a convenience method for exec(const WPoint& p) that uses the event's document coordinates. Executes the popup besides a widget. Shows the the popup at a position. Displays the popup at a point with document coordinates point. The positions intelligent, and will chose one of the four menu corners to correspond to this point so that the popup menu is completely visible within the window. Shows the the popup at the location of a mouse event. This is a convenience method for popup(const WPoint&) that uses the event's document coordinates. Shows the popup besides a widget. Returns the last triggered menu item. The result is 0 when the user cancelled the popup menu. Configure auto-hide when the mouse leaves the menu. If enabled, The popup menu will be hidden when the mouse leaves the menu for longer than autoHideDelay (milliseconds). The popup menu result will be 0, as if the user cancelled. Hides or shows the widget. Hides or show the widget (including all its descendant widgets). When setting hidden = false, this widget and all descendant widgets that are not hidden will be shown. A widget is only visible if it and all its ancestors in the widget tree are visible, which may be checked using isVisible(). hide() and show() are considered to be stateless slots by default. If you override setHidden() and need to modify server state whenever it is called, you'll need to call WObject::isNotStateless(). Specifies a maximum size for this widget, setting CSS max-width and max-height properties. The default the maximum width and height are WLength::Auto, indicating no maximum size. A WLength::Percentage size should not be used, as this is (in virtually all cases) undefined behaviour. When the widget is a container widget that contains a layout manager, then setting a maximum size will have the effect of letting the size of the container to reflect the preferred size of the contents (rather than constraining the size of the children based on the size of the container), up to the specified maximum size. Specifies a minimum size for this widget, setting CSS min-width and min-height properties. The default minimum width and height is 0. The special value WLength::Auto indicates that the initial width is used as minimum size. A WLength::Percentage size should not be used, as this is (in virtually all cases) undefined behaviour. When the widget is inserted in a layout manager, then the minimum size will be taken into account. Signal emitted when an item is selected. Unlike the itemSelected() signal, triggered() is only emitted by the toplevel popup menu (and not by submenus).